It has been pointed out that avid Dyspathy.com reader and DUI lawyer, Daniel Hajji has posted his "grossly non-compliant and inappropriate" motion on the homepage of his law firm's website. This is the equivalent of a kindergartner taping has "finger painting" to mommy's refrigerator in a desperate search for approval. As the battle heats up between Woodward's Friend and SuperMichiganLawyer, writers from across the region have begun to take notice. Bill Shea at Crain's Detroit and Aaron Foley of MLive.com have both weighed in. It will be interesting to see what tomorrow will bring. Detroit -- The owner of the Ambassador Bridge has filed a lawsuit against the U.S. Coast Guard as well as Canadian and American government officials, saying they are stalling efforts to build a second span over the Detroit River. 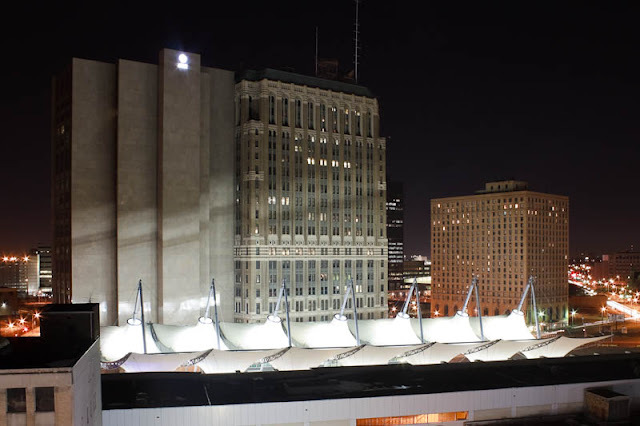 According to the suit filed Monday in U.S. District Court by the Detroit International Bridge Co., owned by Manuel "Matty" Moroun, and the Canadian Transit Co., a proposed competing bridge plan, the Detroit River International Crossing, violates a long-standing law passed by U.S. and Canadian governments settling ownership and maintenance of the Ambassador Bridge. That included "the right to construct a new span to replace an older span that requires substantial maintenance to extend its useful life," the suit read. 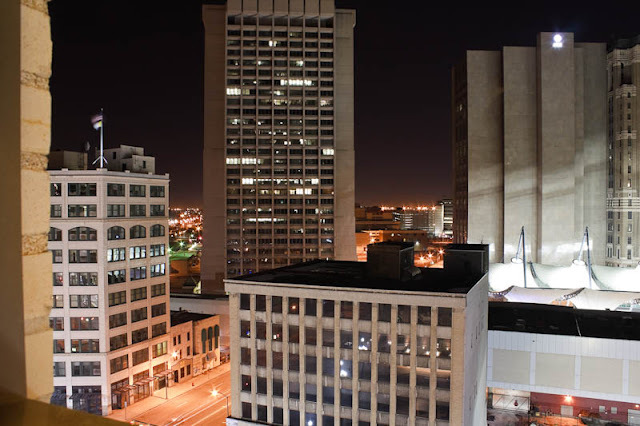 As you know, former Mayor Kwame Kilpatrick is required by law to pay restitution to the City of Detroit based on 30% of his current income, benefits and gifts received. Sadly, we are back in court tomorrow to put an end to the prosecutor's goal to increase his restitution payments based on rumors and innuendo and not facts. We feel confident the facts will speak for themselves tomorrow. 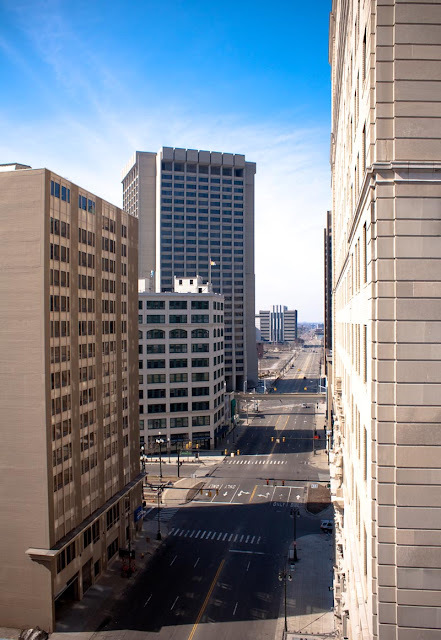 It is ironic these court issue continues to be top news stories in Detroit as the new Mayor gives his State of the City address. Kwame Kilpatrick is the former Mayor and not the current Mayor. External to his court problems, former Mayor Kilpatrick's accomplishments for the City of Detroit speak for themselves, including new hotels, new private and public sector jobs, a new Riverfront, national and local special events in a then vibrant downtown Detroit, new parks and recreation centers, new casinos bringing valuable revenue to the City, cleaner streets and much more! Why is former Mayor Kilpatrick a scapegoat for all? I certainly hope that Mike Paul buys his client a new shirt for tomorrow's hearing just to avoid any confusion. Apparently, second chair counsel for a certain felonious ex-mayor has had his feeling hurt and doesn't understand satire. He emailed Woodward's Friend a cease and desist letter this past weekend. That lawyer's only claim to fame is writing a notorious appeal on behalf of his client to halt his probation violation hearing. The filing was deemed "grossly noncompliant and inappropriate" by Judge Karen Fort Hood. His cease and desist letter was poorly written as well. 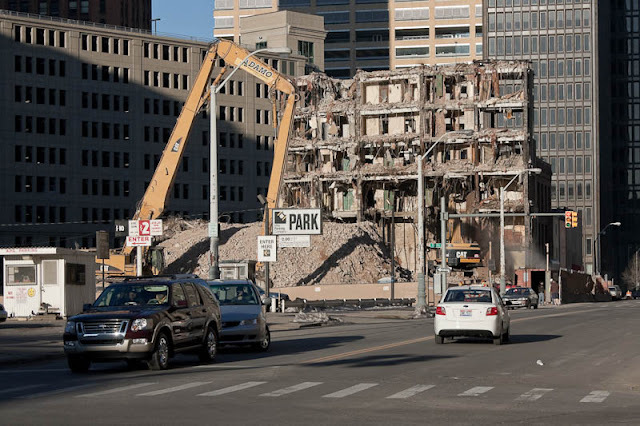 In honor of the demise of the Lafayette Building, Faded Detroit brings you the Olde Building. 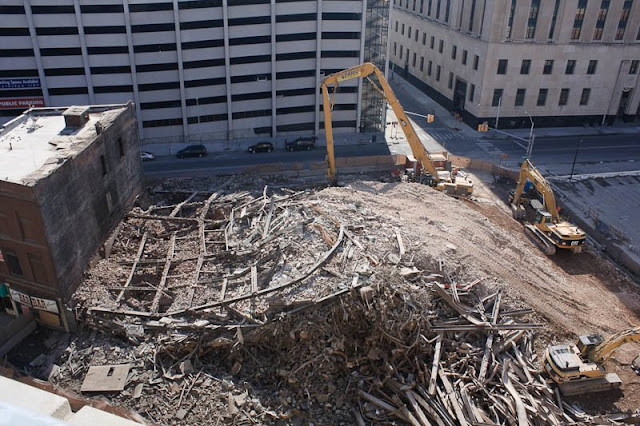 The former Grand Trunk office building came down in 2004 to provide more parking for the Dime Building. 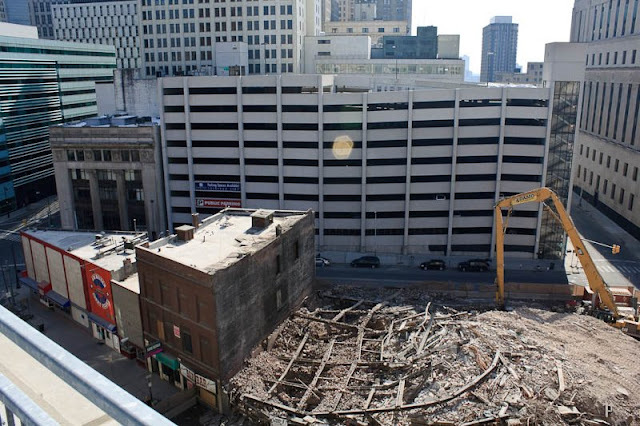 This was followed by the the demolition of People’s Outfitting Company (Detroit Commerce Building) in 2007 and the Lafayette Building in 2010. The Lafayette Building has fallen. The remains of the structure were brought down Saturday night. All that remains are bits and pieces of its steel skeleton and a pile of debris.